CVS is an endless repository of new and exciting drinks, though I probably lean on them too much. But see, I have this bottle of Del Maguey Mezcal de Vida burning a hole in my bar, and then this brilliant opportunity to mix it with an amaro comes along, and how could I resist? Amaro Nonino tends toward the sweeter side of amari, and I find that, much like Cardamaro, it occupies the same same general flavor profile as a good sweet vermouth. 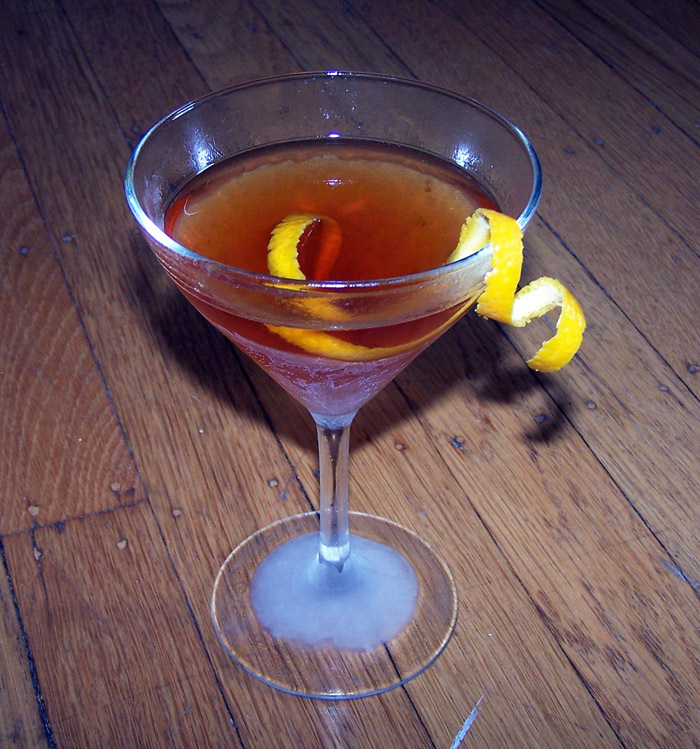 Make a Manhattan with Nonino or even Ramazotti instead of vermouth and you’ll see what I mean. They are substantially different from a sweet vermouth, but when you put them in your drink, they do the same thing. In light of this similarity, I think this drink, Des Esseintes, is a lot like a Martinez with mezcal instead of gin. Of course, the devil is in the details, and I think the pairing of Nonino and Mezcal is a grand one, so much so that I tried to realize it with gummy bears, but you shouldn’t do that, probably. Stir over ice and strain into a cocktail glass. Garnish with an orange twist. The mezcal’s smokiness made for an enjoyable riff on a classic, but overall this was too sweet for my palette. I think it would have been a lot better with only one ounce of amaro, particularly because Nonino is so very sweet. If someone asked me for a mezcal drink, this is not the first one I would make for them, but it might be the third. Categories: modern drinks | Tags: agave, amaro, amaro nonino, angostura, angostura bitters, bitters, booze, cocktailc, cocktails, drinking, drinks, luxardo, maraschino, mezcal, mixed drinks, orange, orange bitters, orange twist | Permalink.